NextSinger Songwriter Lisa Mitchell has still ‘So Much To Say’! Every now and then I will invite a special guest to write about their five favourite streets (or places) in their own city and or somewhere around the world that they have managed to travel to. It is my hope that my guests will lead you on a tour of streets that may be historic, nostalgic or just simply great places that are important to them. Today, I am honoured to have Sharon M. Wolf, as my next guest in this brand new series. She has traveled extensively to places of real beauty and wonder, and regards herself as simply a lucky traveler. Without further ado I will let Sharon take you on her tour of her ‘best streets in the world’. 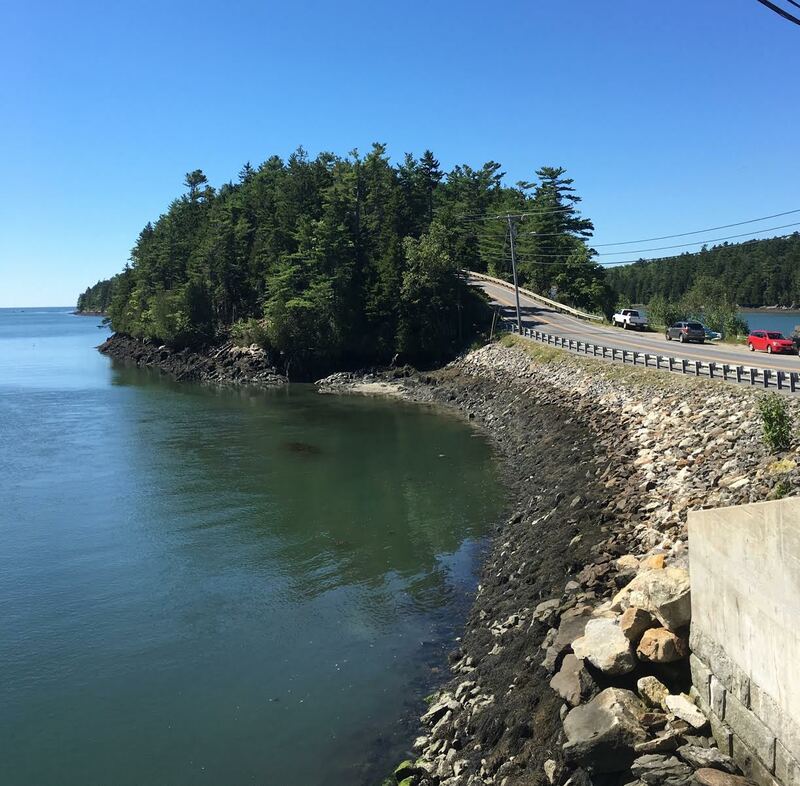 Harpswell Island’s Road Route 24 Maine, USA. This is my all time favourite street/road. The road resembling a grey ribbon divided by a yellow stripe, slices through the water island hopping as it goes. The road changes names as it winds its way through Casco Bay. It passes through a number of islands: Gurnet, Great Island, Orr’s Island, and its last stop is Bailey Island. Its abrupt ending at Land’s End (a proper term for it) is the last point of land you see. The Atlantic (big pond) goes all the way to Europe from this point. As well as my favorite, it is a well traversed road. Many lobstermen, fishermen, islanders, and tourists have been charmed by this coastal route. The scenery is unrivaled. It travels over the Cribstone/Honeycomb Bridge, a rarity indeed. It’s blocks are arranged so the tide can flow through it. There’s a small space underneath for locals to quite their boats through. The road goes on passing the beautiful Mackerel Cove where fishermen once hauled in ten foot tunas. The scene is quite Maine and picturesque. The boats bob up and down and the lobster shacks are covered in colourful buoys, as the hungry gulls screech overhead. It goes past The Giant’s Staircase, natural shaped rocks that look like stairs that descend into the sea. It passes restaurants with the freshest seafood I’ve had anywhere. There are a number of lodging places as well. When the sign says road ends 25 feet, it means it! There is a tiny island with a lighthouse directly across the way to guide the water traffic through the foggy days. There’s a gift shop at the end of the road smelling like candles and homemade fudge and pine scented pillows. There’s a statue of a Maine lobsterman, a tribute to all the men who’ve braved the elements to make a living in the extreme climate here. Every bit of this road is filled with childhood and adult memories for me. I’ve traveled this road since I was small. The changes of time have not stepped in thankfully. So, it never loses its magical quality. The road is also stepped with local lore, history, ship and pirate tales, but that’s a story for another time. Via di Nocera Ancient Pompeii, Italy. The road that time forgot, In the Shadow of Vesuvius Via di Nocera, rises from the Necropolis under Porta Nocera and winds its way through ancient Pompeii. 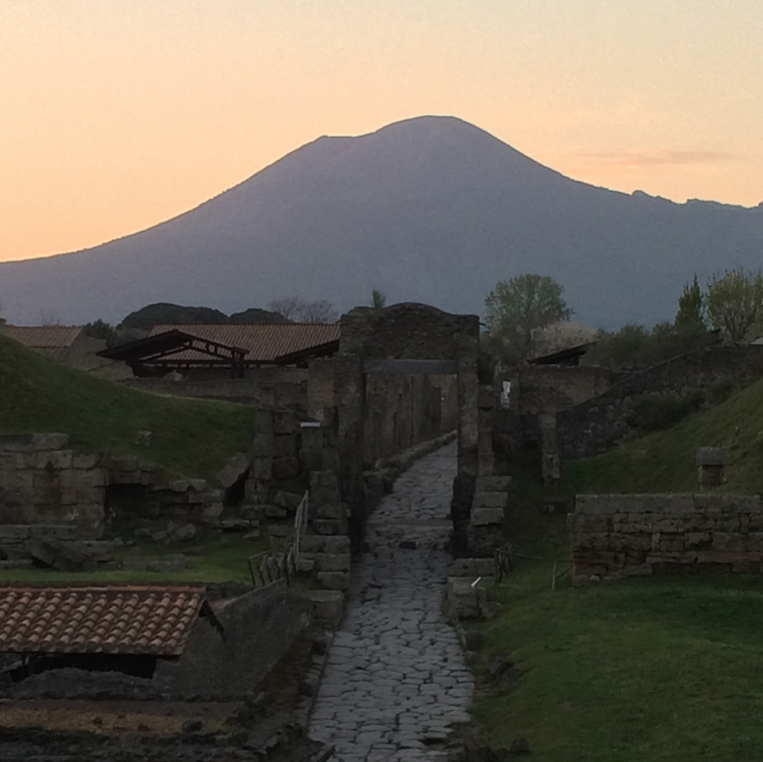 I could easily have picked 5 favourite roads in Pompeii. However, I chose this for a few reasons. Whether you are walking down to or up from the Necropolis, it is an amazing experience. Once you pass through the gate, up two blocks on the right there is a large portal that leads down to the Palestra and Amphitheater. This portal could be closed, thus creating crowd control for the Amphitheater. The road also leads south out of the city to the old town of Nuceria. The residents came to Pompeii for some games in the Amphitheater. In 59 AD a dispute started. Shouts and taunts led to stone throwing and swords were drawn. It ended in quite a bloody fight. It was so bad the Emperor and the Senate got involved. They banned the games in Pompeii for ten years. Tacitus the historian has recorded this. A wall painting of the bloody battle was found in the House of Actium Anicetus. It’s also on the cover of one of my books. there isn’t enough room to describe all the great frescoes and graffiti that line both sides of this amazing street. So, I will end here. This photo of Via di Nocera is my favourite view. Via dei Fori Imperiali, Rome, Italy. The Via dei Fori Imperiali in Rome is one of my favorite streets. It runs from Piazza Venezia and through the centre of ancient Rome. The first time I went to Italy, I entered Rome this way. In the back of the cab on the way to the hotel I got my first glimpse of the Colosseum. That was all it took to hook me on Ancient Rome. You’re just driving along and boom… there it is an incredible archeological reminder of Rome’s amazing past. Once at the hotel, I walked back down this way. The modern day street itself seems out of place amidst all the ancient ruins on either side. The Forums of Trajan, Augustus, Nerva and the Roman Forum all compete for your attention. It was hard to know where to point my camera at first. Night was falling quickly on this road into the past. The streetlights came on as more people strolled along the sidewalks on both sides of the street. The moon was full and the stars were twinkling welcoming me further and further into another time. The smell of gelato mixing with the lovely Italian was as intoxicating as their wine. I looked up standing on this road and saw the full moon and the north star through the arch of the Colosseum. What an incredible sight. It made a great photo too! My first night in Rome was unforgettable due to the Via dei Fori Imperiali. I’ve been back twice and this is the first street I wander down always marvelling at the beauty of Rome, the eternal city. The old saying “All roads lead to Rome” fits here as well. All roads lead to my favourite road in Rome. This street holds incredible memories for me. I stayed at the 5 star Majestic hotel in Santorini, Greece. This photo was taken from the front porch of my room. 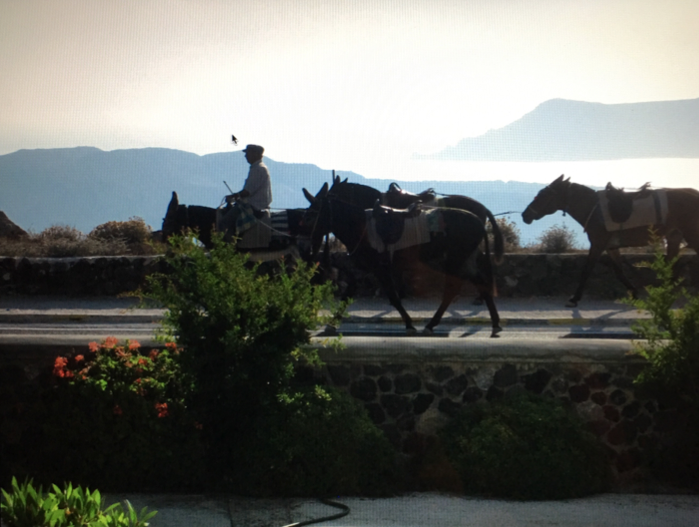 The street lies between the Aegean Sea and the famous caldera. A caldera is caused by a huge volcanic eruption when the mouth of the volcano collapses and forms a crater that fills with water. Parts of volcano have popped up forming islands. The one seen here is Crocodile Rock. The road is filled with tourists, residents and the local donkeys picture above. You can hear their bells jingling as they travel down the busy street. The scenery on this road was just unbelievable. The cliffs of Santorini can be seen. Their white washed houses and bluer than blue domed roofs perched against the sky of blue. I’m fortunate to say I walked this road quite a few times. Gazing out to the caldera I understood how all the Greek myths originated. It’s so beautiful and surreal that anything could happen there. After touring the caldera by boat the view from the road was a nice memory. The Aegean on the other side of the road is beautiful as well. The caldera view is just more dreamlike. A lot of people stopped their cars out front of my porch to look or take a photo. I felt incredibly lucky to just walk out the door and be there. The road winds it’s way into Santorini. The town has a winding path lined with shops, restaurants, and views of the huge cruise ships dwarfed by the massive caldera. To experience the sounds of the Greek language, the food aromas drifting out tantalizing your taste buds, the scent of ouzo on the air: just follow one of my favorite streets into the other worldly beauty of Santorini. Khmer Road System, Angkor Wat, Cambodia. The Khmer Road system definitely qualifies as one of my favorite Streets. It was an adventure in an adventure. I’ll never forget all the traffic buzzing by our small group in our tuk-tuk. A tuk-tuk is a small open carriage driven by a moped/motorbike. Elephants, water buffaloes, monkeys, and chickens passing us made the other traffic quite boring. Tuk-tuks, motorbikes and pedestrians all took up their own areas of our small one way road. The road went on for miles sometimes passing camps, stores, monkeys, chickens, and amazing ruins every where. I went down the road 6 times sometimes in different areas. probably the most memorable trip being the one on the way to see the sunrise at Angkor Wat. Words can’t describe the beauty and wildness of the sunrise in front of me making Angkor Wat look like a fiery painting. All the while behind me was the huge moon still out over the temple in the jungle. It’ll always be one of my favorite streets as I’ll probably never share the road with elephants, monkeys, chickens and Oh! I forgot the holy pigs, yes, holy pigs, our guide told me. The incredible ruins that I saw in Angkor Wat: Bayon Temple, Phnom Baking, Ta Prohm, were all amazing and set in the jungle. One ride took us about 20 minutes. The trees growing over the ruins looked other worldly. This is a vast road system constructed by King Jayavarman VII who ruled the Khmer Empire. It stretches through a lot of South East Asia. I hope to go back someday. Sharon M. Wolf runs an elementary library for 425 students plus staff. She has done Pompeii, volcano, and Machu Picchu presentations for her town program, the town Public Library, and her school in Enfield. Her favorite topics are Pompeii, ancient ruins, and her newest interest is Byzantium. 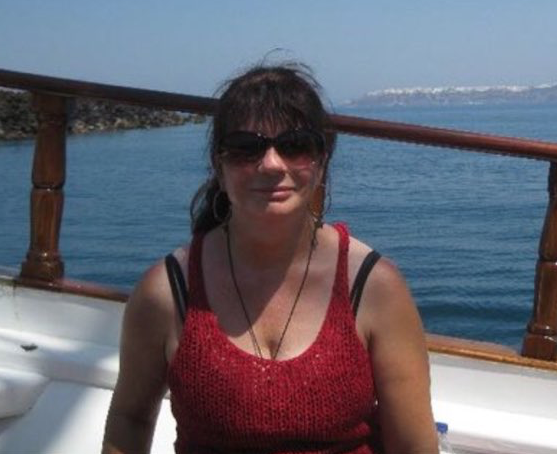 You can discover the latest news from Sharon M. Wolf via her travel and photography tweeter account @aftertheflash, and if you are interested in her archaeology adventures and history tweets visit @SharonMWolf. Photo Credits: All images are courtesy of Sharon M. Wolf, who is the copyright holder. They may not be copied or re-used for any purpose without her consent or permission.